Stimulating you baby’s senses cannot start early enough. While they might not respond to your advances in the early stages of their development, sub-consciously they are learning and this will help their advancement later. Here are some brain development activities for babies – i.e. new-borns to six month olds. Massage your baby tenderly. There are techniques which ease his muscles and mind, and help him to relax and respond more diligently to the changes in his environment. If you are unsure about how to do this, there are plenty of books available to train you. Talk to them as much as possible, such as when you are changing their diaper or feeding them. Explain slowly to them what you are doing, and pause at the end of sentences. This will teach them good conversational habits. Many people think it isn’t beneficial to talk like a baby to a baby, but this isn’t the case. This dramatized manner is termed “parentese” and has been known to stimulate the baby’s brain. Listening to songs is a great brain development activity for babies. This isn’t as mundane as the constant chatter they hear every day. The melodious nature of songs and singing means they will be receptive to it, thus stimulating their brain into development. Read to you baby with specially customized baby books, which have simple pictures. Do the voices of the various animals or characters in the books. This will have the same effect as your singing. Playing peek-a-boo teaches your baby about object permanence, i.e., even though they cannot see you, they’ll know you are still there. This will develop the bond between you, as they will always feel you are never too far away. Don’t allow your baby to get bored in the one position all day. 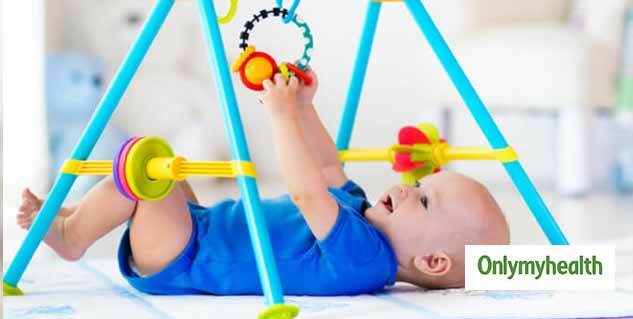 Move them from their cot, to a rocking chair, to the ground or play-pen, every 30-45 minutes. The constant change of environment and positioning will influence their minds and promote thought. Allow your baby to touch and feel objects throughout the day. Be careful that these objects are safe and they cannot put them into their mouth or injure themselves. They will learn to use their hands and limbs. Give them a rattler as well, and allow them to shake it throughout the day. When the baby is on his back, on the ground, hang various objects or toys a few inches above them. They will learn to focus their eyes on them and will soon try to reach out to touch them. Take your baby out in the fresh air regularly and allow them to see worldly things like animals, cars and buildings in real life. The fresh air is also very good for the baby’s brain and promotes brain development. Practice these brain development activities for babies every day and you will soon notice them evolving into spirited and intelligent individuals.